The emergence of high-throughput molecular biology technologies has opened up for studying biological phenomena at increasingly detailed level. These technologies, such as biological sequencing, are evolving to supersede most of the current assays, providing comprehensive and accurate results with an in many cases faster process and more affordable price. However, their widespread uptake in clinical care for diagnostic, prognostic, and therapeutic use has yet to be realized; in many cases due to challenges in data management and –analysis, as well as lack of bioinformatics expertise at hospitals. Long-read single molecule sequencing is a novel technology that enables sequencing of large genetic regions on the level of single DNA molecules in a single experiment. This not only improves sensitivity but also enables studying the effect of compound mutations which has previously not been possible. However, the data generated is large and requires new types of analysis pipelines and automated systems to enable the uptake in clinical care. Another recent technology is mass spectrometry-based metabolomics, which has received a lot of attention in the search of new diagnostic markers, however there are significant challenges in data analysis and management in order to validate the technology and enable it to reach clinical routine applications. In this project, we seek to narrow the gap between academia and hospitals by developing methods and establishing systems to enable clinical care to take advantage of massively-parallel long-read single-molecule sequencing (LRSMS) and high-throughput metabolomics in routine diagnostics. 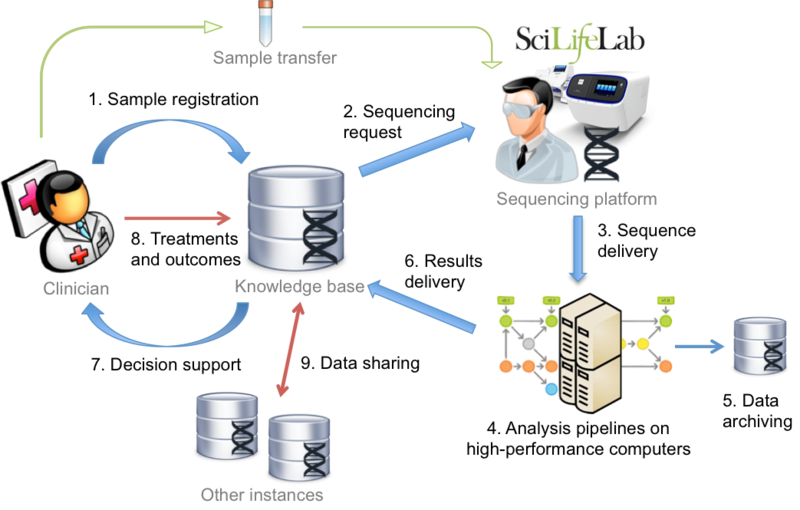 Specific aims include the development of automated pipelines and data management systems for translating LRSMS for use in diagnosis of Chronic Myeloid Leukemia (CML). A second aim is to overcome the specific bioinformatics challenges when analyzing large-scale metabolomics data from neurological disorders, and pave the way towards ultimately bringing it into clinical routine practice. The CML project is carried out in close collaboration with Clinical Genetics at Uppsala Academic Hospital (UAH), the National Genomics Infrastructure at Science for Life Laboratory (SciLifeLab), and is part of e-Science for Cancer Prevention and Control (eCPC) – a flagship project at the Swedish e-Science Research Center (SeRC). The metabolomics project is carried out in collaboration with the CARAMBA platform at Clinical Pharmacology, UAH and is also part of the EU H2020-project PhenoMeNal which has the aim to establish a European e-infrastructure and platform for data analysis in clinical metabolomics. We develop automated data analysis pipelines that can run on high-performance and cloud computing resources to integrate and process large-scale data sets, and where results are delivered to structured databases. We also apply data mining and machine learning methods, and develop means for clinicians to interact and interpret the analysis results via web-interfaces. A necessity for this is scalable and interoperable e-infrastructures, and we use applied cloud computing and virtual infrastructures to deliver micro-service based architectures enabling researchers and clinicians to work with data on public and private Infrastructure-as-a-Service providers; the latter also facilitating operations on sensitive data.